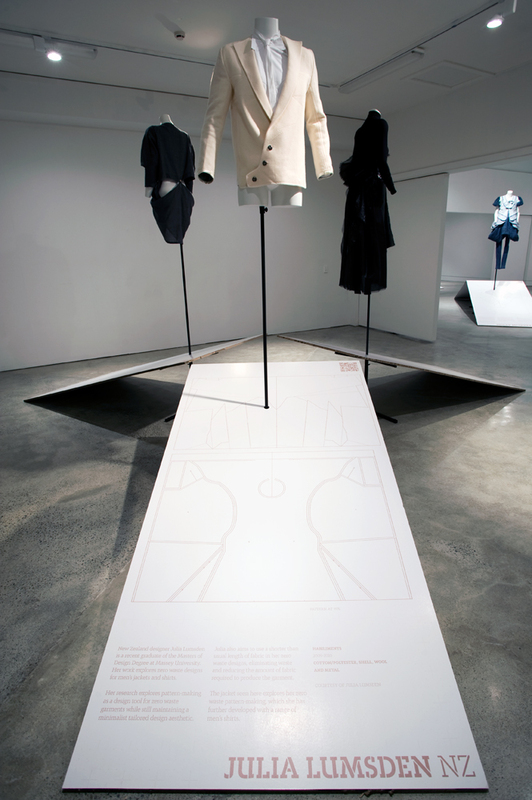 Julia Lumsden has recently completed her Masters of Design Degree at Massey University Wellington, developing techniques for designing zero waste menswear which she first explored in 2009 for her undergraduate collection. Her research explores pattern making as a design tool for zero waste garment while still maintaining a minimalist tailored design aesthetic. Julia also aims to use a shorter than usual length of fabric in her zero waste designs, eliminating waste and reducing the amount of fabric required to produce the garment. The jacket seen here explores her zero waste pattern-making – beginning by eliminating/straightening all the curved lines in a classic mens three piece jacket pattern. This was done to test if straight lines made zero waste design easier (as seen is straight cut garments) and also if it lent its own aesthetic to the final design. 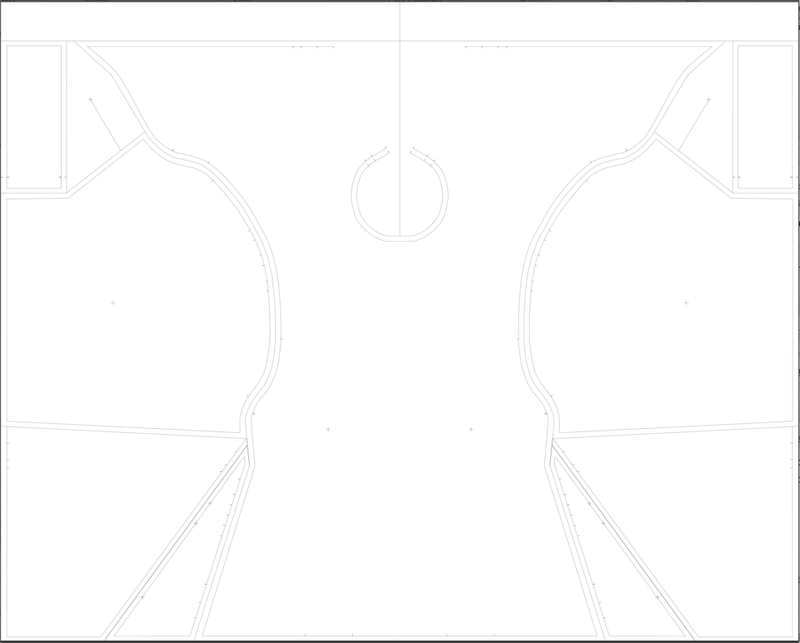 This was achieved using the ‘Alterations Menu’ in the CAD software Gerber and she continued to use this software to develop the pattern to eliminate waste. Once the pattern was laid out in a marker in gerber, pieces were overlapped in places where removing a section of the jacket would not be detrimental to the fit. 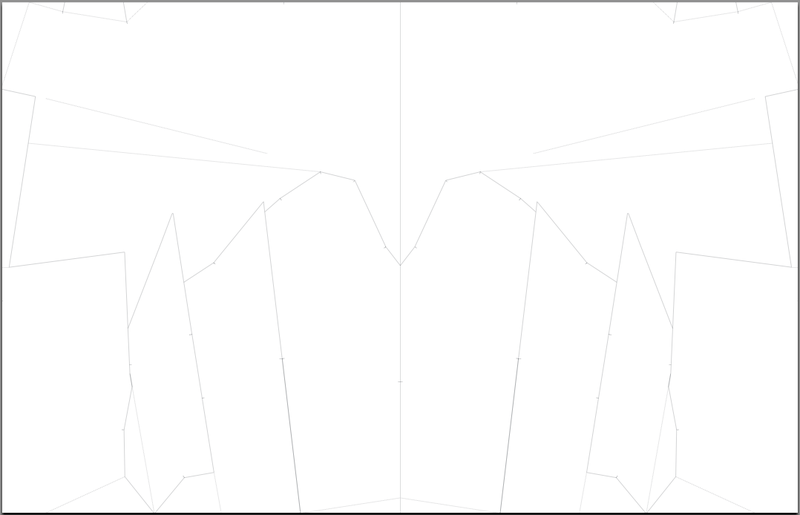 The negative spaces were then incorporated into adjacent pieces creating normal shaped pattern piece but with additional ‘tabs’ extending from the pattern piece. Once resolved the garment pieces were cut out and when constructing the tabs were folded to the interior and top stitched down creating subtle detailing, shaping and reinforcement. The resulting Jacket is moth minimalistic and highly detailed in parts – the fit and aesthetic harks back to a classic Dinner Jacket. habiliments Jacket Pattern, 2009, courtesy of Julia Lumsden. The other garment in YIELD is a zero waste mens shirt which was developed as part of a range of mens shirts all using zero waste goals. 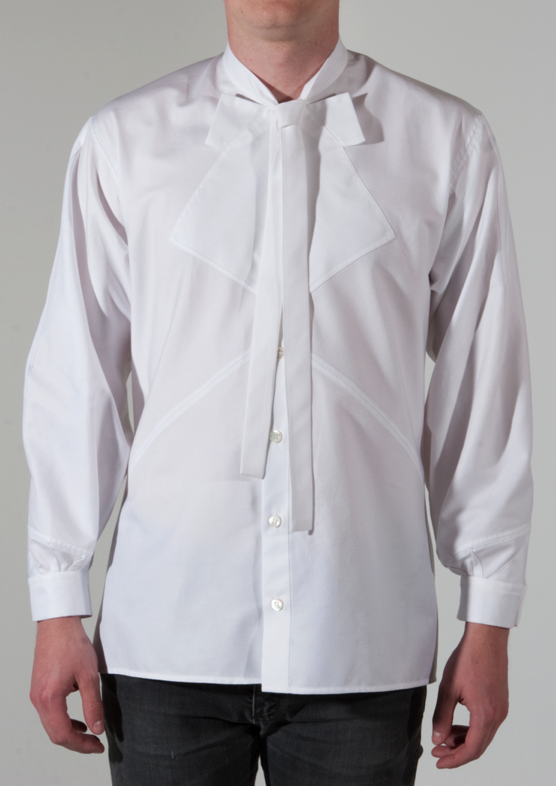 The shirt once again refers to a formal style similar to the dinner jacket, with a bibbed front and a ‘bow-tie’ effect. It is key to Julia’s design practice that the final garment look like a traditional shirt in many ways – it was important that the garment be ‘approachable’ by not just the fashion forward men out there, but by everyday guys also – something i feel she has succeeded in. The pattern for this shirt was developed through a complex process of modifying a standard contemporary mens shirt pattern using techniques she identifies as Piecing, Blending, Nesting, Merging and Creating – helpfully giving names to the techniques that many zero waste designers use everyday. Identifying and naming these techniques was a key part of her masters project and gives other zero waste designers a language we can use and add to. 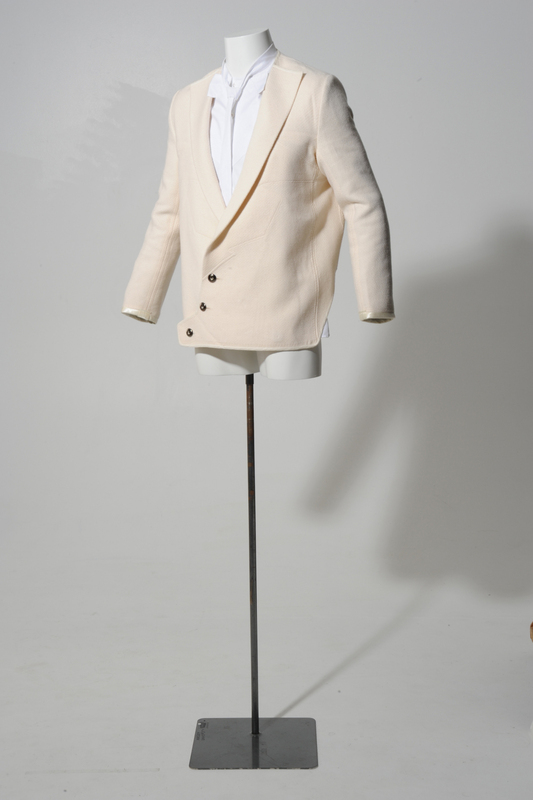 Both the Jacket and the Shirt are exquisitely crafted garments, finished to a very high standard. The pattern making process she uses leads to some complex construction in order to finish her garments to the standard she expects, which she then resolves beautifully. The striking aspect of Julia Lumsden’s garments is the degree of aesthetic refinement apparent in her work when operating within the confines of zero waste pattern design. Achieving results which are contemporary, original and totally wearable.